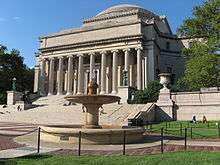 The Columbia University Graduate School of Journalism is one of the professional graduate schools of Columbia University. Located in the Morningside Heights neighborhood of New York City, it is the only journalism school in the Ivy League and one of the oldest in the United States and the world. The school was founded by Joseph Pulitzer in 1912, and offers Master of Science and Master of Arts degrees in journalism as well as a Ph.D. in communications. In addition to graduate degree programs, the Journalism School houses the Pulitzer Prizes and administers several prizes, including the Alfred I. duPont–Columbia University Award. It also co-sponsors the National Magazine Awards and publishes the Columbia Journalism Review, essentially a trade publication for journalists. A faculty of experienced journalists with varying specialties—including politics, arts and culture, religion, science, education, business and economics, investigative reporting, national and international affairs—instruct Journalism School students. Faculty members are preeminent in their fields, and many have won numerous journalism awards including the Pulitzer Prize, the Guggenheim Fellowship, the duPont-Columbia Award, the National Magazine Award, and the National Book Award. The Journalism School was founded with a bequest from Joseph Pulitzer. In 1892, Pulitzer offered Columbia University's president, Seth Low, money to set up the world's first school of journalism. The university initially turned down the money. Low's successor, Nicholas Murray Butler was more receptive to the plan, however. It took the university many years to act on Pulitzer's $2 million gift and pitch for a journalism school. Classes began on September 30, 1912, with a student body of about 100 undergraduate and graduate students from 21 countries. The building was still under construction at the time. In 1935 Dean Carl Ackerman led the school's transition to become the first graduate school of journalism in the United States. Classes of 60 students dug up stories in New York City during the day and drafted articles in a single, large newsroom in the journalism school at night. Columbia Journalism School's ten-month master of science program offers aspiring and experienced journalists the opportunity to study the skills, the art, and the ethics of journalism by reporting and writing stories that range from short news pieces to complex narrative features. Students choose from one of four specializations: newspaper, magazine, broadcast, or new media. Some students interested in investigative reporting are part of Stabile Center for Investigative Journalism, a sub-specialization of the M.S. program. The M.S. program is also offered on a part-time basis. The school also offers dual-degree programs in collaboration with other schools at Columbia: Journalism and Computer Science; Journalism and Law; Journalism and Business; Journalism and Religion; Journalism and International and Public Affairs; and Journalism and Earth and Environmental Science. The school also offers dual-degree programs with Sciences Po in Paris and the University of Witwatersrand in Johannesburg, South Africa. The nine-month master of arts program is for experienced journalists interested in focusing on a particular subject area: politics, science, business, or the arts. M.A. students work closely with Journalism School professors as well as professors from other academic departments at Columbia. The program is full-time. The Ph.D. program draws upon the resources of Columbia University in a multidisciplinary approach to the study of communications. Students craft individual courses of study from the departments and divisions at the University, including Journalism, Political Science and Sociology, the professional schools of Business and Law, and Teachers College. 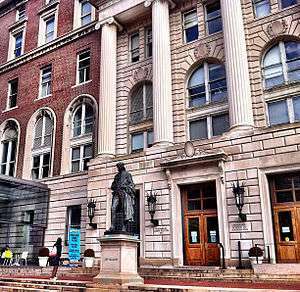 The Journalism School administers many professional awards, a tradition that Joseph Pulitzer began when he established the school and endowed the Pulitzer Prizes at Columbia. The Journalism School directly administers the Alfred I. duPont-Columbia University Award; the National Magazine Awards; the Maria Moors Cabot Prizes; the John Chancellor Award for Excellence in Journalism; the Lukas Prize Project; the John B. Oakes Awards; the Mike Berger Award; and the Paul Tobenkin Award for Race Reporting. The Pulitzer Prize administrator's office is located in Pulitzer Hall; since 1975, the Prizes have been awarded by the president of the University on the recommendation of a board of journalists and academics, of which the dean of the Journalism School is an ex officio member. ↑ James Boylan, Pulitzer's School: Columbia University's School of Journalism. Columbia University Press (2003). pgs. 3-10, 13-16. 1 2 "History of the Journalism School". Columbia University. 2010. Retrieved 2011-01-09. ↑ "Master of Science Degree". Columbia University. 2010. Retrieved 2011-01-09. ↑ "Dual-Degree Programs". Columbia University. 2010. Retrieved 2011-01-09. ↑ "Master of Arts in Journalism". Columbia University. 2010. Retrieved 2011-01-09. ↑ "Doctor of Philosophy in Communications". Columbia University. 2014. Retrieved April 27, 2014. 1 2 "Journalism Awards". Columbia University. 2010. Retrieved 2011-01-16. CJS alumnus Michael Lewis, Senior Editor (July 1993). "J-school Ate My Brain". The New Republic. p. 5.